Coverage: about 80% of our albums were present in the Amazon Music Unlimited library. Specifying Discs and tracks: for albums consisting of more than one disc, there appears to be no way of specifying that Alexa should start playing Disc 2 as opposed to Disc 1; and, similarly, there’s no way of getting Alexa to play a particular track number. Voice Recognition: Alexa couldn’t recognise about 10% of the Artist/Title combinations even though I had checked that they were actually available in Amazon’s Music Unlimited library. Since then I’ve been using Alexa and Amazon Music Unlimited to listen to newly issued albums reviewed in the Guardian/Observer newspapers, and now have a further substantial set of experience to compare with my original findings. The first thing to say is that being able to listen to complete albums, as opposed to just samples of each track from Amazon on my laptop (as I have been doing previously), is, obviously, a far more rewarding experience; and to be able to listen to a range of new releases from start to finish, regardless of whether or not they suit one’s innate preferences, is a real luxury. Most I will never listen to again – and some I have cut short because I really didn’t like them; but there are a few which I’ve really liked and have made a note of at the back of our ‘Sounds for Alexa’ book. At least I now feel a bit more in touch with what sort of music is being produced these days. Coverage: Since last February I’ve checked out eleven lots of review sections comprising write-ups of 121 albums. Fourteen of these albums were issued in CD format only, and all the other 107 albums were available in Amazon in MP3 format. All but nine of these 107 were advertised as being available for streaming or available to ‘Listen with your Echo’ (the latter being the Alexa device); and of these nine, six did actually play through the Echo device. Of the three that didn’t, two would play only samples (Bob Dylan’s ‘Triplicate’, and The Unthanks’ ‘The songs and poems of Molly Drake’); and for the other one (Vecchi Requiem by Graindelavoix/Schmetzer) Alexa repeated “Vecchi Requiem” perfectly but said she was unable to find any album by that name. Given that only three items were actually unavailable, I conclude that a lot of the new albums that are being issued in digital format are available in the Amazon Music Unlimited service. Specifying Discs and tracks: It still appears to be the case that it’s not possible to specify that Alexa play the 2nd disk in a two disk album, nor to play a particular track number. To get round the multiple disks problem, a number of people in the Reddit noticeboard suggest creating a playlist in which the two discs are listed separately. As for the track number, Alexa will step through the tracks if you keep saying ‘next track’; but, if you really do want a particular track played, the best way to achieve that is to use the name of the track when requesting it – both of the following worked for me: ‘Play Kashmir by led Zeppelin’ and ‘Play Cromwell by Darren Hayman’. Voice Recognition: Of the 121 albums I checked out, Amazon claimed that 98 of them were available to play through the Echo, whereas, in fact, I could only get 85 of them to play. For eleven of the other thirteen albums, Alexa just couldn’t understand what I was requesting; and in the remaining two cases, Alexa a) insisted on playing “Rock with the Hot 8 Brass Band” instead of “On the spot” by the Hot 8 Brass band, and b) played Mozart‘s Gran Partita by the London Philharmonic instead of by the London Symphony Orchestra. Turning to the 85 albums that did play through the Echo, it was significant that only 59 of them played at the first time of asking. For the other 26, I had to repeat the request at least twice and as many as six times (these details are included in this Recognition Analysis spreadsheet). Naturally I was trying out all sorts of combinations of all or part of the particular album title and artist. After much trial and error I have taken to first asking for both the album title and the artist (play me X by Y); then, if that doesn’t work, to ask for the album title on its own (or even just parts of the album title – for example, 1729 for the album title “Carnevale 1729”). Finally, as a last resort, to just ask for the Artist. This strategy proved successful in all but 3 of the 26 instances that didn’t play at the first time of asking. These figures indicate that Alexa’s voice recognition capabilities haven’t improved much since my last write-up in February. This view is reinforced by my (undocumented) experiences of trying to get Alexa to tell me about various golf, rugby and cricket events. Her responses have usually been either about a completely different event or just that she doesn’t know. Perhaps I’m not asking the questions in the right way….. at least Alexa is usually able to provide a weather forecast at the first time of asking. In her defence, I should mention that my son seems to have no trouble in adding all sorts of outlandish things to our Alexa shopping bag (which, I should add, we don’t use – Alexa just provides it if you want to put things into it). From this summary of my recent experiences with Alexa, it seems that little has changed. 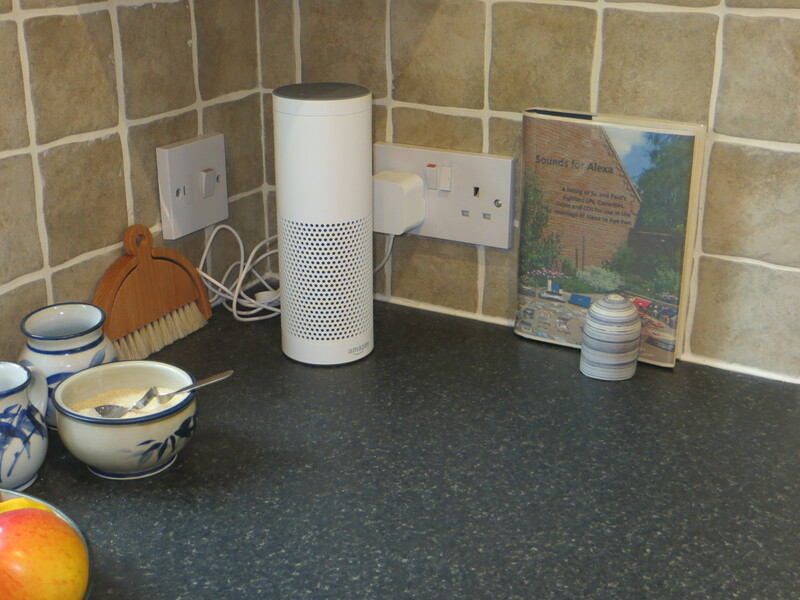 Whilst Alexa’s voice recognition capabilities don’t seem to have improved much, the usefulness of the device compared with having stacks of CDs around, is undiminished. So much so, in fact, that we have replaced our last remaining CD player, which was in the conservatory, with another Echo device; and we’ve upgraded to Amazon Music Unlimited for 10 devices at £9.99 a month. There are undoubtedly many other uses that we could be putting Alexa to – the weekly email from Amazon always suggests several new things that one can ask her or get her to do. We haven’t really followed any of them up. Perhaps I’ll get to printing out the email each week and putting it next to the echo as a prompt. Or maybe I won’t – we’ll see. One thing’s for sure: what with all our CDs in the loft, and no stand-alone CD player, Alexa is going to be with us for the indefinite future. A. AI to collect virtual objects at our specific request: The Facebook ‘on this day’ function that we can choose to turn on or off, is a good example of this in use in a contemporary system. In future systems we might imagine that we have an AI which is independent of any one system but which we could ask to collect specific objects across the systems we specify, for example, ‘collect all photos that we look at in our email, in Facebook and on Instagram’. B. AI to collect digital objects at our general instruction: This is similar to step A except that we won’t have to specify the systems we want it to monitor. We‘ll just provide a blanket instruction such as ‘collect everything to do with any shopping I do’, or ‘collect all photos I look at’, and the AI will address the request across all the systems we use. At this stage the AI should also be taking care of all our backup requirements. C. AI to understand what it sees in the digital objects: If we have asked the AI to collect objects for us, in this step it will be capable of fully understanding the content of the objects, and of having a conversation about what they are and the connections between them. At this point there will be no need for indexes to digital collections since the AI will know everything about the objects anyway; it will be able to sort and organise digital files and to retrieve anything we ask it for. The AI will also be handling all our digital preservation issues – it will just do any conversions that are necessary in the background to ensure that files are always readable. D. AI to exploit our digital objects for us at our request: Now that the AI has control of all our objects and understands what they are, we may just be able to say things like, ‘assemble a book of photos of the whole of our family line and include whatever text you can find about each family member and have three copies printed and sent to me’. E. Eventually we leave it all to AI and do nothing with digital objects ourselves: By this stage the AI will know what we like and don’t like and will be doing all our collecting and exploiting for us. We’ll just become consumers demanding general services and either complimenting or criticising the AI on what it does. The last stage above reflects one of the possible futures described by Yuval Harari in his book ‘Homo Deus’ in which AI comes to know us better than we do ourselves, since it will fully understand the absolute state of the knowledge we have and be able to discount temporary influences such as having a bad day or some slanted political advertising. This clearly represents a rather extreme possible situation many decades hence; nevertheless, given what we know has happened to date, we would be foolish to discount either the rate or the content of possible development. However, we should also remain absolutely clear that it will be us, as individuals, that are deciding whether or not to take up each of the steps described above. Throughout this period of the rise of AI, we will still be dealing with our physical world and our physical objects. AI may be able to see the physical world through lenses (it’s eyes), and be able to understand what it is seeing, and we may well get the AI to help us manage our physical objects in various ways. However, it won’t be able to physically manipulate our objects unless we introduce AI-imbued machines (robots for want of a better word). This too is a distinct possibility – especially since we are used to having machines in our houses (we’ve already made a start with robot vacuum cleaners and lawn mowers). However, having tried to think through the various stages that we would go through with using robots, I came to a bit of a brick wall. I found it very hard to envisage robots rooting round our cupboards, putting papers into folders, and climbing into the loft. It just seems unrealistic unless it was a fully fledged, super-intelligent, human-type robot – and that in itself brings with it all sorts of other practical and ethical questions which I’m not equipped to even speculate about. Perhaps all that can be said with any certainty about such a future of AI software and robots, is that humans will take advantage of whatever technology is on offer provided it suits them and they can afford it. A number of recent or ongoing developments give an indication of what technologies we might be using in the future to create, use, and exploit our digital objects. They are described below. The various dates quoted are taken from the internet’s Wikipedia. GPS position data in photo tags: It has now become a standard camera feature to include location data in the metadata tag of every photo taken, by using GPS position data. The tags also include full details about the camera, the settings used, and of course the date. All this data is acquired automatically and placed in metadata tags which are mostly hidden unless specifically looked at. Impact on OFC projects: Systems will increasingly use all available information and data sources to build up a set of knowledge about each digital object. These other sources may include calendar systems, emails, texts, social media and the internet. Music recognition: Shazam and other internet services identify music, movies, advertising, and television shows, based on a short sample played through the microphone on the device being used to run the relevant application. Shazam first started operating in 2002 and this kind of functionality is now well known and widely used. iPhone 8 users can ask Siri, its virtual agent, to identify what music is playing and it will provide the answer after interacting with Shazam in the background. Face recognition: Google’s Picasa programme was one of the first photo management applications to offer a face recognition capability in 2008. Since then, the function has become a commonplace feature provided in a host of applications and mobile phone apps. Not only can you search for a face within a set of photos, but also across the whole internet. Image recognition: Google’s image search capability was amazing when it first came out in 2001; but was even more astounding when a reverse image search function was added in 2011 which searched for images similar to one uploaded or specified. Nowadays, it is a heavily used function which most Google users are familiar with. Impact on OFC projects: The ability of computers to recognise music, faces, objects – anything – will become increasingly sophisticated and accurate. It will develop from just being able to find similar things, to understanding what particular things are in the same way that we can recognise a piece of music as being classical, or a face being European, or a particular animal being a cat. Future software that manages digital objects will also have an understanding of what those objects are. RFID: The cheaper RFID (Radio Frequency Identification) systems for tracking objects can be purchased for less than £400 and they will continue to drop in price. The cost of the tags that are attached to the objects you want to monitor are a few pence each. Smart home devices: There is a growing market for systems to control a wide variety of home devices including heating, lighting, sound systems and security. This is currently the most prominent aspect of a general idea referred to as the Internet of Things (IoT) in which communicating chips are built into products to assist their manufacture, use and maintenance. Impact on OFC projects: Many of the physical possessions we obtain in the future will include a chip which contains information about the object and which can communicate with parent apps. We will become familiar with controlling objects in this way and with using the parent apps. We will attach our own RFID tags to our important possessions that are not already chipped, so that we can keep track of them within the same control systems. Facebook’s ‘on this day’ function: Facebook provides its users with the option of being regularly presented with historical posts from the same date some years ago. These remind people of what they were thinking and doing, and who they were interacting with, in the past; and reawakens their memory of those events. Impact on OFC projects: This sort of feature will be incorporated in many systems that accumulate user’s digital objects. Users who like it will come to regard it as a primary source of prompts for their memories. As the collections of objects grow over time, they will become increasingly valuable to individuals. Users will also become accustomed to not having to put any effort into saving material because the systems will do that for them. The culture of sharing and being public: Today, a great many people want to upload, share objects, and get likes. There is less interest in private reflections, diaries and private photo collections. Impact on OFC projects: People will increasingly want to share the broad range of digital objects (i.e more than just photos) in their collections with others. Systems will continue to be developed to enable them to do so. Perhaps families will possess their own virtual spaces to curate their own history. The emergence of Virtual Reality: Virtual Reality (VR) has been under development for over 30 years but has still not become mainstream technology. However, several of the major technology companies including Samsung and Facebook, have products; and some use is being made of it in computer gaming. The industry is searching for a killer application – something like 360 degree videos, for example, or augmented reality in which virtual objects are superimposed on a picture of the real world. In the meantime, however, there is a continuing belief that the technology will eventually be widespread. Impact on OFC projects: VR could eventually provide a controlled access exhibition space in which to manage and display all your digital objects. Voice interaction: Voice recognition products emerged in the 1980s and have been getting better and better ever since. However, in recent years, three different personal assistant-type technologies which use voice as their primary interface with the user, have become widespread: Apple’s Siri, Microsoft’s Cortana, and, more recently, Amazon’s Alexa; and it is these three that are familiarising the majority of ordinary users with the idea of using voice as a primary interface to their mobile phones and their computers. Alexa is being used initially as an interface to Amazon’s Echo device which accesses Amazon’s huge music library and the internet. The ability to stand in one’s kitchen and suddenly desire to hear a particular piece of music and to say, for example, ‘Alexa, play the album No Secrets by Carly Simon’ and to have it start playing 5 seconds later, is amazing, and is indicative of how easy it will be in the future to pull up any of our digital objects including photos and mementos. Impact on OFC projects: The capabilities of the voice interface will continue to improve until it becomes as reliable as normal conversation. A considerable amount of computer interaction currently performed using keyboards will migrate to voice. Users will become used to the idea of asking the computer for information and answers, and having the computer respond with what they want. OFC is a general technique for organising all sorts of things – in fact almost any sort of thing – but mostly things that belong to individuals in their own houses. A significant change that has occurred to the physical things in people’s houses over the last 70 years is that they have increased enormously in quantity. We are in an era of constant economic growth, supported by rampant consumerism; we accumulate a lot more things and we don’t use those things for as long as we used to. Consequently, often the reason people start an OFC-type sort out is simply that they have accumulated too much stuff. Alternatively, they turn to the self storage services which rent out self-contained rooms in a building into which customers can put anything and can access as and when they please. Such services are now widespread. This consumer-driven overload of personal possessions is unlikely to change very much in the future unless a cataclysmic event occurs such as economic collapse, war, or natural disaster due to climate change. Within the general growth in possessions, there are some areas in which technology has resulted in some shrinkage. Perhaps the best example is the replacement of many (but not all) LPs and CDs by digital MP3 music files. Another is a reduction in paper telephone directories, newspapers, magazines, instruction books and manuals. 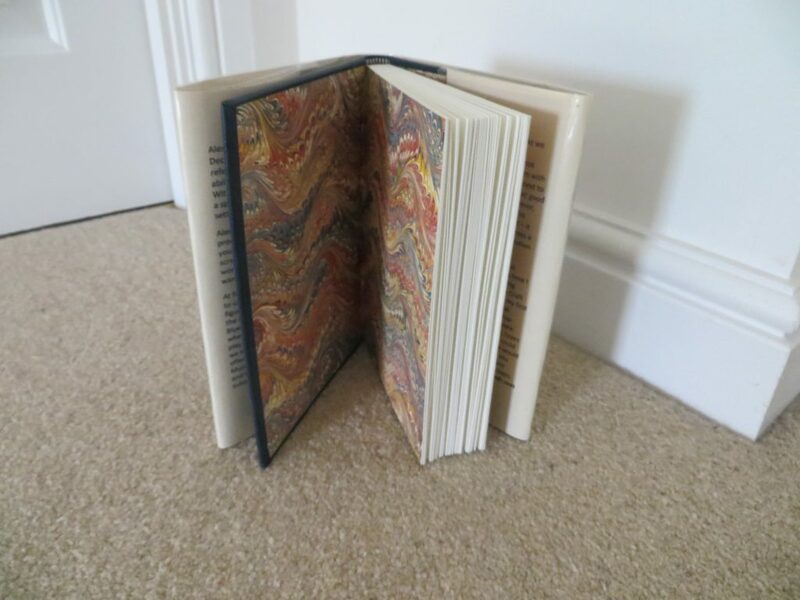 Books are vulnerable – though sales appear to be holding up at present. Conversely, there is one emerging technology that could actually start to increase the number of physical possessions we have – 3D printing. This is a long way off being cheap enough and useful enough – perhaps fifteen years or more. Nevertheless, if some significant consumer uses for the technology emerged, this could become as common as ordinary printing is today. Turning to digital objects, we only started to accumulate these about thirty years ago, and for such items we are still on an upward growth path. Emails, texts, Facebook entries, photos – these are some of the digital items which are now an integral part of people’s lives, and we continue to acquire more and more of them every year. In the areas of general household transactions – finance, purchasing, insurance, transport, holidays etc. – more and more is being done electronically and more and more digital objects are being produced to support the transactions. Of course, we have the option to discard some if we want to, but the overall trajectory is still upwards because a) we are still in the process of moving transactions into the electronic environment, and b) the technology gives us little reason to clear things out; in today’s systems, digital storage is plentiful and cheap and there is no impact on physical space whether you have a small number of electronic files or a huge number of them – in both cases they are essentially invisible. For the collections we start deliberately as hobbies (stamps, books, Clarice Cliff ceramics, firemen’s helmets etc. ), there is unlikely to be any downturn. With any luck, humans will continue to be fascinated by the challenge of finding and assembling collections of particular types of physical objects for a long time to come (something which is more difficult to forecast is whether people will start to collect particular types of digital objects as a hobby). For today’s physical hobby collections, there are already many digital services and apps which provide auxiliary support, and it is easy to see these increasing in number and sophistication. The hobby collection of the future is likely to be a hybrid with the digital objects being 3D spin photos, fully indexed, displayed in a virtual exhibition space with access controls enabling the owner to allow specific individuals or the general public to view part or all of the collection. Perhaps virtual exhibitions of contributions from individual collectors will be curated and made available on the net. Perhaps such things already take place…..
Of course, unless specified otherwise, we usually assume that an object is authentic and original. This is not always the case with physical objects; and it is probably even easier to fake digital objects. We have long had problems with movies misrepresenting historical fact ‘for the sake of the story’; and today we are having problems with fake news on the net. In the future, we will need to become more cautious about authentication, and more honest and diligent in the declaration of fictions. When it comes to inheriting things from our deceased relatives, physical objects are relatively straightforward to deal with even though there are now greater quantities to sort out. Digital objects, however, are much more problematic. It could take an awful long time to get to grips with somebody else’s computer files, and there is less incentive to actually do so since the system is probably not taking up a great deal of physical space. Furthermore, many of the files will probably be in some service in the cloud, each of which will require effort to access and comprehend. Having said that, some services such as facebook enable you to specify a ‘legacy contact’ who will manage your memorialised account after you die. Other net services offer to store account information and passwords for you and to pass them to whoever you specify when you die. As the digital environment becomes increasingly central to people’s lives, the use of such services and the inclusion of stipulations in wills about digital content, will become increasingly prevalent and important. However, even if you have been given all the information about someone’s accounts, the adage ‘out of sight, out of mind’ is still particularly apt; rather than undertaking a thorough OFC exercise, it could be easy to just unsubscribe from a particular service that the deceased used to use, or to let an old laptop you inherited just languish in a cupboard until it becomes obsolete and unusable. This section attempts to provide a view of some of the future developments that might affect the topics discussed in this tutorial. The developments that are outlined are based only on general reading not detailed research; however, hopefully they indicate the broad direction of travel. Readers should be aware that, after writing sections 1-5 of this tutorial, but before starting on this section 6, I deliberately read ‘Homo Deus’ by Yuval Noah Harari in order to give me an up to date basis of where the technology is headed. 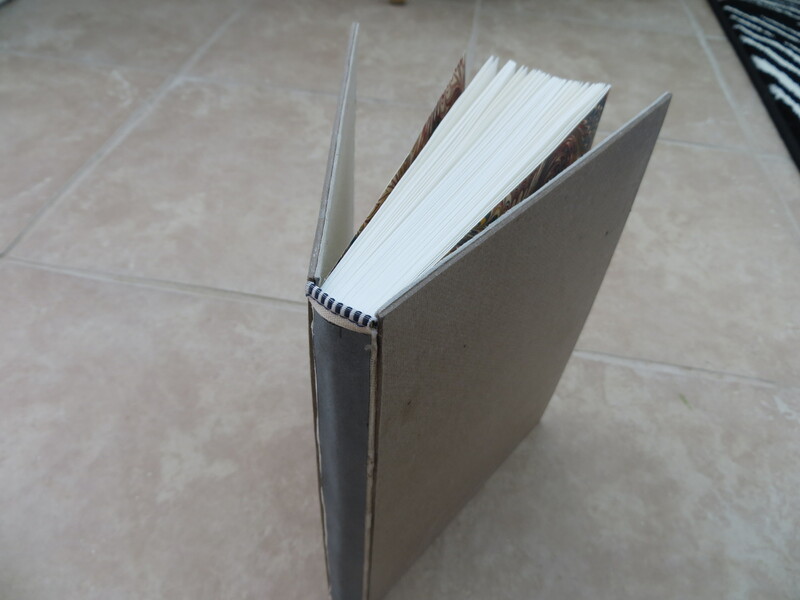 The book gave me far more than that – it also provides an insight into what we are and why we do things. Several of its ideas have found their way into this section of the tutorial. This view of the impact of future development on OFC is in the four parts listed below. First it considers what will happen to the things that are fundamental to OFC projects – the items themselves. Second, it assesses the impact of developments that are occurring today; and then it looks at the impact of the dominant coming technology of Artificial Intelligence (AI). Finally, the overall impact of all these developments is summarised. Although digital technology provides many benefits, unfortunately there are some unavoidable overheads that go with it. One of these is the absolute need to backup digital files to avoid loss by system crash, virus infection, or theft. Backups can be done in a variety of ways including to external hard disk or to DVD or to a cloud service. However, the important thing is that they are done regularly so that all your material is backed up at any one time. Background facilities that do this automatically for you each time a new file is created, are the most reliable. For particularly precious files, it is best to have more than one backup and to keep one of the copies at some other geographical location away from your house. Even with reliable backup arrangements in place, there is another longer term threat to your digital objects – out of date computer hardware and software. Computer technology is continuing to change rapidly, so just because you can access and use your digital objects today, doesn’t necessarily mean that you will be able to do so in twenty years time – especially if you have been using less well known application programmes. Generally speaking, if you keep updating your equipment every six or seven years, and if your files are in common formats such as Word, Excel, PDF and JPG, then you should be OK. However, even then you will need to be checking every few years that you can still access all your files, and to be converting those that are in danger of becoming unreadable to newer longer-lasting formats. For small scale digital collections, this is probably best done on an ad-hoc basis when you are considering purchasing your next computer system (though, if you want to take a more structured approach, you may find it useful to construct a maintenance plan. However, for organisations with large scale digital collections, this is a very serious problem and a field of study called Digital Preservation is now well established with many umbrella organisations and thousands of practitioners throughout the world. Some of the organisations issue guidance about file formats and these can be found by searching the net for ‘digital preservation file formats’. 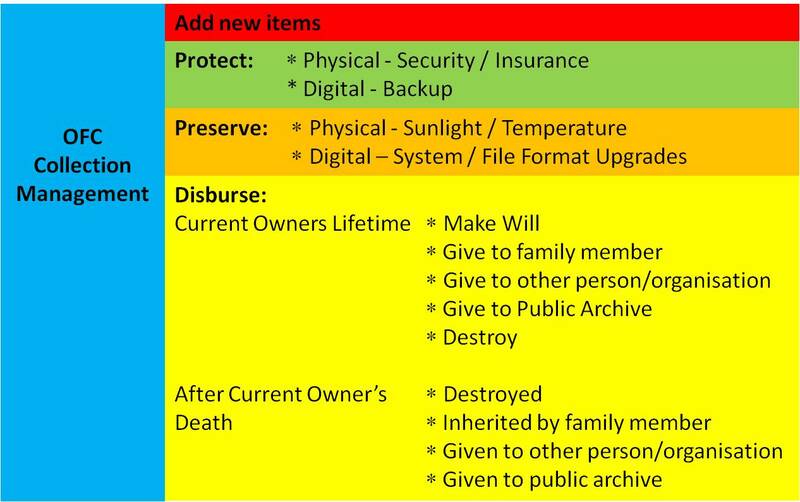 The above discussion concerns digital objects; however, the general issues of protection and preservation can also apply to physical objects as well. For example, particular types of physical objects can be badly affected by sunlight and hot room temperatures so these factors have to be taken into account when choosing storage locations; and periodic checks should be made to ensure that the condition of the collection is not deteriorating. Theft too is another potential hazard, though this should be addressed by the household’s general security arrangements and insurance policies. The ultimate protection of storing things in bank vaults seems to defeat the point of having the collection in the first place. If a slightly broader perspective is taken, the overall maintenance – or management – of a collection will not only include all of the above, but also the activities of adding new material (as discussed in U5.6) and its eventual disbursement. Regarding the latter, owners have the option of either writing down what they wish to occur in a will, or of actually carrying out the disbursement themselves during their lifetime. All these activities are summarised in the diagram below.